Tuthill’s excellent reputation is based, to a large extent, on a style that combines stone-wheel engraving with brilliant geometric cutting, produced with a high degree of precision on excellent blanks. The pattern on this plate is called “Orient” according to an ad that was placed by the Philadelphia jewelry firm of Bailey, Banks and Biddle in an as-yet unidentified publication about 1910. It is reproduced in The Hobstar, Vol. 5, No. 4, p. 5 (Jan 1983). The ad shows cut and engraved glassware exclusively. In keeping with the conservative practices of established jewelers at this time it does not mention the Tuthill company by name, but all of the cut-glass patterns shown can be found on signed Tuthill glass. “Orient” could be the factory name, but it is equally likely to be one assigned by the retailer. Until its status is confirmed, the name should be enclosed within quotation marks. 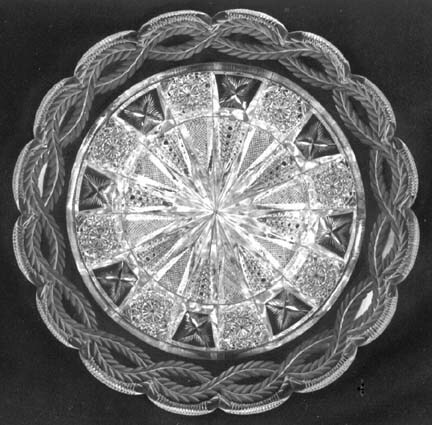 Plate cut and engraved in the “Orient” pattern by the Tuthill Cut Glass Company (signed). Early twentieth century. D = 7″ (17.8 cm), wt = 1.5 Lb (0.7 kg). This plate is considered a rarity; it sold for $650 in 1982. [c1900 Salesmen’s Photo Inventory] This is a collection of photographs: geometric patterns, all numbered (two with names added: Bar Harbor and Columbian). 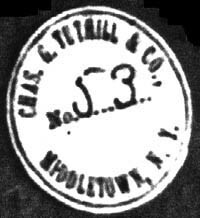 Some, perhaps all, of the items were cut at Tuthill’s shop in Corning (1895-1899) and continued to be produced in Middletown, NY for a few years after Tuthill moved there in 1899. The photo inventory contains the paper label shown on the left. It was probably used only to identify glass sent to dealers and removed before resale. The number 53 identifies the pattern used. The photo inventory has been duplicated on a CD-R that can be obtained from the ACGA, P. O. Box 482, Ramona, CA. Crofford, Maurice, 2001: THE RICH CUT GLASS OF CHARLES GUERNSEY TUTHILL. Texas Univ. Press, College Station, TX, 211 pp. Emmerson, Leigh, 2005: ACGA Tuthill document, The Hobstar, Vol. 28, No. 2, pp. 4586-8 (Oct 2005). Pearson, J. M. and D. T. Pearson, 1965: AMERICAN CUT GLASS FOR THE DISCRIMINATING COLLECTOR, pp. 149-156. Pearson, J. M. and D. T. Pearson, 1969: A STUDY OF AMERICAN CUT GLASS COLLECTIONS, pp. 129-131. Sinclaire, E. F. and J. S. Spillman, 1997: THE COMPLETE CUT & ENGRAVED GLASS OF CORNING, pp. 167-168 and pp. 287-289. Waldron, A. J., 2000: New sources revise Tuthill history. Part 1, The Hobstar, Vol. 23, No. 2, pp. 10-15 (Oct); Part 2, The Hobstar, Vol. 23, No. 3, pp. 14-18 (Nov). See Smith 2005b (pp. 531-46) for correspondence between Louise Boggess and Wallace Turner concerning the pattern names that have been assigned to Tuthill cut glass. 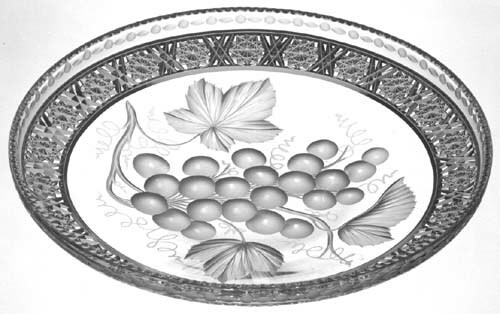 Tray cut and engraved in the “Vintage (Intaglio Grapes) with Geometric and Engraved Border” pattern by the Tuthill Cut Glass Company (signed). D = 9.88″ (25.1 cm), H = 1.5″ (3.8 cm), wt = 2.25 lb (1.0 kg). Sold for $675 in 1988. 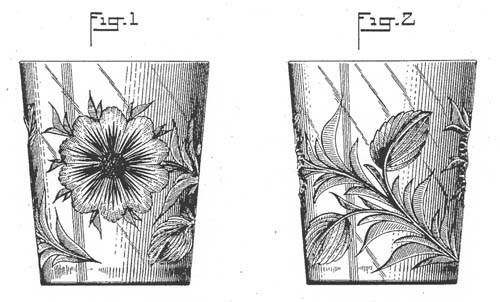 Only one patented pattern is associated with the Tuthill Cut Glass Company. The asterisk (*) indicates that the patent was retained by the patentee; it was not assigned to the company. The patent’s specification does not name the pattern, nor does it describe the design. Actual pieces cut in patent no. 42,367 are shown in Pearson 1965 (p. 154, lower right) and Pearson 1969 (p. 129).